International departure taxes of $110 plus current fuel surcharges of $250 are included (subject to change). Today we depart Pittsburgh and connect with our overnight flight aboard a wide-bodied jet. We enjoy in-flight movies, dinner and breakfast aloft. We arrive in Lisbon where we are greeted by our Unitours tour manager who will remain with us for the duration of our pilgrimage. We enjoy a short orientation tour of Lisbon before heading to Fatima. En route, we celebrate Mass at the church of the famous Eucharistic Miracle in Santarem. This evening, we will have the opportunity to join the International Rosary Procession. Dinner and overnight at our hotel in Fatima. 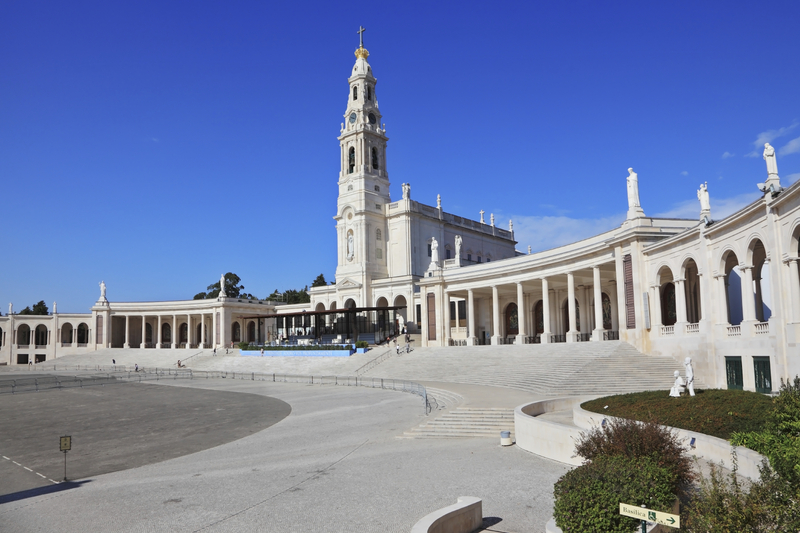 This full day is devoted to visiting the Basilica and Shrine of Our Lady of Fatima. We will also see the birthplaces of Francisco, Jacinta and Lucia to whom the Virgin appeared for the first time on May 13th, 1917. We celebrate Mass at the Chapel of the Apparitions. In the evening, we once again join the International Rosary Procession. Dinner and overnight at our hotel. Today we celebrate an early Mass in Fatima, before heading north. Time permitting, we will briefly stop in the ancient capital and University City of Coimbra, where Lucia, the last Fatima visionary was a cloistered nun. We continue northwards into Spain and on to Santiago de Compostela, the most ancient of pilgrimage routes. Tradition holds that the Apostle James was cast ashore here preaching for seven years and was responsible for the conversion of Spain, before returning to the Holy Land. The Cathedral with its splendor, and portico is a masterpiece of Romanesque art. Upon arrival this afternoon, we enjoy a visit to the Cathedral and the Old City. We will also have the option in the early evening of walking a small portion of the Camino. Dinner and overnight Santiago. Following our walk to Mass at the Cathedral of Santiago we return to our hotel for breakfast and then head east to Santander along one of the many “Routes of St. James”. While this is our longest coach day, the wonderful scenery of mountains and sea awe us, as our roads hug the northern Spanish seacoast. Lunch on our own is taken along the route. Dinner and overnight in Santander. This day is spent in devotion to Our Lady of Lourdes. 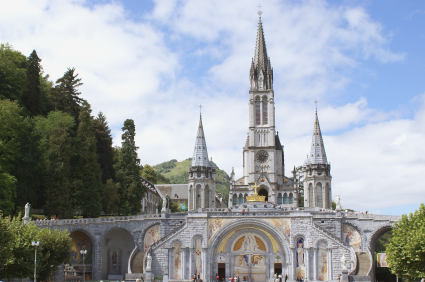 We will celebrate Mass at the Grotto, visit the Shrine and enjoy a walking tour of Lourdes. We will also visit Boly Mill, where St. Bernadette was born, the Cachot, formerly used as a jail, where she lived during the apparitions, and the parish church. There will be free time for private devotions, the Eucharistic Procession, the Blessing of the Sick or the legendary, and entering the healing waters of the miraculous Lourdes spring. Dinner and overnight at our hotel. In the evening, we can once again join the Torchlight Marian Procession. This morning we depart Lourdes and traverse the Pyrenees entering Spain. We travel eastward to Zaragoza, the capital of Aragon. On arrival, we will tour this city which was founded by the Romans. Its luxuriant vegetation, with its many cascades and grottos make it a miniature Switzerland in the middle of arid upper Aragon. Zaragoza is also the birthplace of Goya, whose works grace many of the sites we visit. The number one Marian shrine of Spain, the Pilar Basilica commemorates apparitions of Our Lady of the Pilar to St. James in 40 AD. We will celebrate Mass in the Pilar Basilica. Dinner and overnight at our hotel. After breakfast, we depart Zaragoza, and we journey to Madrid. We will have a driving tour of all the highlights of Madrid, capital of Spain, including the Gran Via Plaza de España, the Viaduct, Plaza Major, the Bull Ring, Independence and Cibeles Squares, the University, and the Paseo de la Castellana. We will celebrate Mass at the Cathedral. Tonight, we enjoy our farewell dinner in a local restaurant with flamenco dancing! This morning, on the feast day of St. Teresa of Avila- we will spend time visiting Avila, where we will celebrate Mass. Avila is the birthplace of Saint Teresa, the founder of the Discalced Carmelites and writer of the Counter Reformation. This afternoon you will be free to explore Madrid, maybe visiting the famous Prado museum. Tonight you are also free to enjoy the culinary delights of Madrid. Dinner on our own. Overnight at our hotel Madrid.